$0.50/2 McCormick Gravies = $0.16 at Price Chopper! 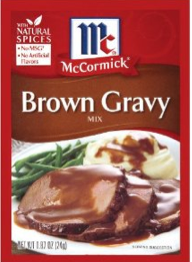 $0.50/2 McCormick Gravies - McCormick Brown Gravy and Low Sodium Brown Gravy are on a multi-week sale for $0.66 each = $0.16 each! Additional gravies such as Herb Gravy, Mushroom Gravy, Turkey Gravy, etc. are on sale for $0.99 = $0.49 each.